کاظمی, ملیحه‌سادات, قاسم‌العسکری, محمدکمال. (769). برآورد پارامتر ناهمسانگردی γ در سازندهای کنگان و دالان با استفاده از نگاره صوتی برشی دوقطبی در یکی از چاه‌های میدان پارس جنوبی. مجله ژئوفیزیک ایران, 5(1), 139-150. ملیحه‌سادات کاظمی; محمدکمال قاسم‌العسکری. "برآورد پارامتر ناهمسانگردی γ در سازندهای کنگان و دالان با استفاده از نگاره صوتی برشی دوقطبی در یکی از چاه‌های میدان پارس جنوبی". مجله ژئوفیزیک ایران, 5, 1, 769, 139-150. کاظمی, ملیحه‌سادات, قاسم‌العسکری, محمدکمال. (769). 'برآورد پارامتر ناهمسانگردی γ در سازندهای کنگان و دالان با استفاده از نگاره صوتی برشی دوقطبی در یکی از چاه‌های میدان پارس جنوبی', مجله ژئوفیزیک ایران, 5(1), pp. 139-150. کاظمی, ملیحه‌سادات, قاسم‌العسکری, محمدکمال. برآورد پارامتر ناهمسانگردی γ در سازندهای کنگان و دالان با استفاده از نگاره صوتی برشی دوقطبی در یکی از چاه‌های میدان پارس جنوبی. 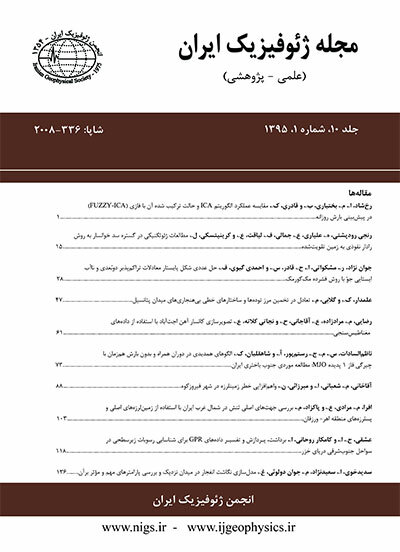 مجله ژئوفیزیک ایران, 769; 5(1): 139-150. تعیین ناهمسانگردی در ژئوفیزیک اکتشافی و ژئوفیزیک مخزن نقش مهمی ایفا می‌کند. نادیده گرفتن تأثیر ناهمسانگردی، عدم تشخیص پارامترهای لرزه‌ای بازتابی و رخساره‌های سنگی را به‌همراه دارد. در محیط ناهمسانگرد یک موج برشی به دو مولفه برشی عمود بر هم تبدیل می‌شود. یکی از معمول‌ترین روش‌ها برای تعیین ناهمسانگردی، بررسی سرعت های امواج برشی در جهت‌های مختلف است. امروزه نیاز به تعیین ناهمسانگردی لرزه‌ای به‌طور قابل ملاحظه‌ای افزایش یافته‌است. با نگاره‌های صوتی برشی دوقطبی (DSI) می‌توان سرعت امواج برشی را تعیین کرد. ابزار صوتی برشی دوقطبی، کُندی امواج برشی را در دو جهت روی صفحه عمود بر محور چاه اندازه‌گیری می‌کند. پارامترهای ناهمسانگردی با اندازه‌گیری مولفه‌های سرعت از نمونه‌های مغزه در آزمایشگاه، داده‌های لرزه ای سه بعدی و داده‌های لرزه‌ای قائم آزیموتی تعیین می‌شوند. در این مقاله، پارامتر ناهمسانگردی γ با استفاده از نگاره‌های صوتی برشی دوقطبی محاسبه شده است. این پارامتر در سازندهای کنگان و دالان، در مجاورت یک چاه اکتشافی در میدان پارس جنوبیتعیین گردید. همچنین پارامتر γ با نمودارهای پرتو گاما برای سازندهای کنگان و دالان مقایسه و میزان ناهمسانگردی به‌دلیل وجود شیل تعیین شد. ضمناً پارامتر γ با پارامتر ناهمسانگردی بر‌حسب کُندی (αDT) مقایسه شد. در این تحقیق همبستگی خوبی بین پارامترهای γ و ناهمسانگردی برحسب کُندی به‌دست آمد. با توجه به نتایج به‌دست آمده، میانگین پارامتر γ، در سازند کنگان 015/0 و در سازند دالان 020/0 محاسبه شد. Anisotropy has an important role in exploration and reservoir characterization. In practice, the determination of seismic anisotropy is not easy, but it has important consequences in enhancement of seismic data recording and processing. Anisotropy interacts with reflection seismology, acquisition, processing and interpretation. Ignoring anisotropy can lead to poor seismic imaging, misleading the seismic reflector responses, inaccurate location of well-ties, and incorrect interpretation of seismic arrival times and amplitudes for the determination of lithology and fluid content. Shear wave velocity anisotropy is commonly referred to as shear wave splitting, because a shear wave traveling in an heteregeneous medium splits into two shear waves. At a given receiver, shear waves are characterized by their orthogonal polarization directions (fast and slow) and a delay between their arrival times. The most common anisotropic models have been related to the framework of transverse isotropy or a hexagonal isotropy system. When the symmetry axis is aligned with the vertical axis, the model is called vertical transverse isotropy or VTI. For a VTI medium, there are five stiffness coefficients and three independent phase velocities. Thomsen (1986) replaced these stiffness coefficients with two vertical velocities (Vp0 and VS0) and three dimensionless anisotropy parameters (namely, ε, γ and δ). Anisotropy parameters can be determined in several ways, including velocity measurements on core samples in a laboratory or from field data in a VSP experiment. A common form of anisotropy observed in many geological area (thinly horizontal layers or fractures). This involves the reference axis of symmetry being normal to the bedding surfaces. Thomsen (1986) introduced three anisotropic parameters (ε, γ and δ) to describe weak anisotropy, which is believed to be the simple model of anisotropy. Thomsen parameters can be computed with the stiffness tensor considered in anisotropic media. Alkhalifah and Tsvankin (1995) showed that, for P-wave Moveout, there exists a range of kinematically equivalent models which are governed by the stacking velocity and introduced by the parameter η. The Dipole Shear Sonic Imager (DSI) is an example of devices that are used to obtain and analyze sonic measurements of formations surrounding a borehole. The DSI Imager can measure the components of shear slownesses in many directions in a plane perpendicular to a borehole axis. The DSI tool is a full waveform acoustic tool that delivers measurements of sonic waves in a wide variety of formations. In the conventional DSI logging tool, one can present compressional slowness, Δtc, shear slownesses, Δts, and Stoneley slowness, Δtst, each as a function of depth. The DSI tool can estimate the orientation and magnitude of stress from velocity dispersion. By inverting the dispersion curves from DSI logs, one can estimate the horizontal stresses. One type of these special dipole modes enables the recording of both inline and crossline (perpendicular) waveforms. These modes, both called cross receivers (BCR) which are used for anisotropy evaluation. In this paper, one of the anisotropy parameters of Thomsen (γ) was determined by the use of S-wave velocities and their relationship with the DSI tool used in the Kangan and Dalan gas zones of the South Pars field. Subsequently, the γ parameter was compared with the Gamma Ray log in depth. The results show anisotropy behavior in shaly zones of Kangan and Dalan Formations. It is found that the average of the γ parameter for the Kangan and Dalan Formations are 0.015 and 0.02, respectively. Also, this parameter was compared with slowness based on anisotropy. A good correlation was observed between anisotropy parameter γ and the slowness based on anisotropy (slowness vector).